It may sound like a wonderful concept - you wake up every morning and things are a bit cheaper than before. Your money is worth just a bit more. And that is (sort of) the situation in Japan currently. 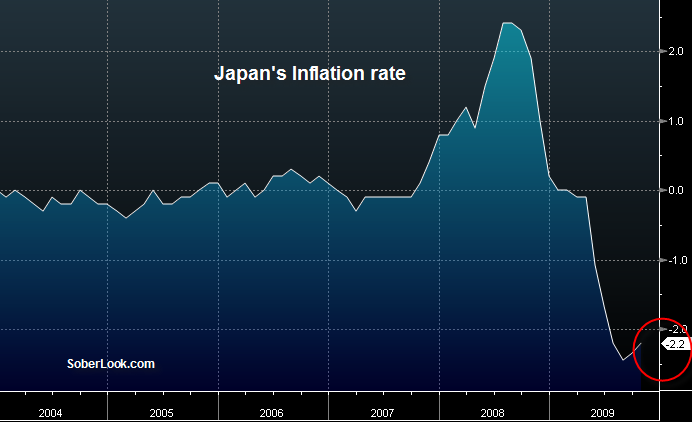 The chart below shows Japan's negative inflation rate. But then you ask yourself, if things are getting a bit cheaper, why buy now, why not wait. And some of that type of thinking is a good thing. But when everyone thinks that, then nobody is buying and the economy stagnates bringing prices further down. This is deflation and it's quite dangerous, because once you are in it, it's hard for the central bank to do anything to get the nation out of it (unlike fighting inflation where central banks have numerous tools). Bloomberg: Prime Minister Yukio Hatoyama’s government stepped up calls on the Bank of Japan to prop up growth after declaring on Nov. 20 the economy was in deflation. Shirakawa, who yesterday pledged to act “promptly and decisively,” has few options given that the key overnight lending rate is at 0.1 percent and the bank is already purchasing government and corporate debt. The broad money supply isn't growing enough as bank lending continues to be constrained. 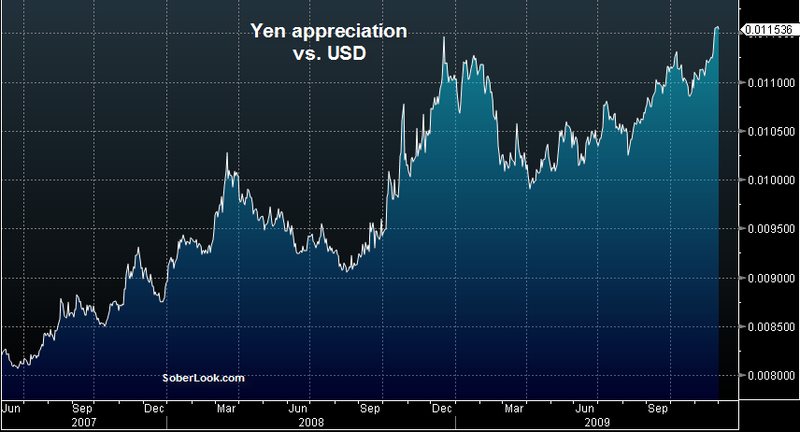 But the real killer is the yen strength. For an economy that is export focused and has a relatively weak domestic demand growth, this is bad news. At this rate Japan will move more manufacturing out of Japan - possibly even to the US (as the US becomes the "high end" outsourcing center). They will also be investing more abroad - all of which is not too helpful for the domestic economy. Bloomberg: The central bank yesterday said it will offer three-month loans to commercial banks at 0.1 percent under the new facility. Governor Masaaki Shirakawa stopped short of boosting the monthly target for government-bond purchases from 1.8 trillion yen, a step analysts said may be taken within months. It's not clear commercial banks will want to borrow from BOJ at all because their ability to fund themselves is not the issue. 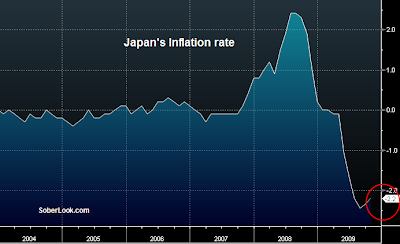 BOJ will need to get far more aggressive to prevent an accelerating deflation (which the nation has not fully come out of for decades). If the current trend persist, expect BOJ to take more aggressive actions to try to deflate it's currency and pump yen liquidity into the system. 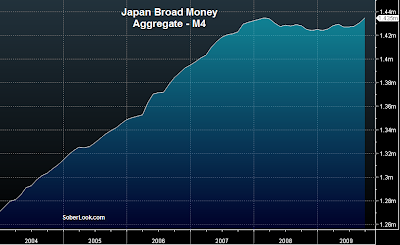 Quantitative easing or even direct currency intervention are quite possible.